Positive dog training is a scientific approach to instilling the best behavior in your Pug. The difference between a well trained dog and an unruly one is noticeable immediately. No matter how cute your dog is, and we know that Pugs are awfully cute, they lose their charm when their behavior is that of a spoiled or poorly behaved dog. The sad part is that it can be remedied with patience and consistency and does not have to involve swatting your dog with a newspaper or constantly yelling at him. Positive training methods exist for all phases of training whether it’s for humans, horses or dogs. It has its roots in the behavioral psychology methods developed by Ivan Pavlov, B.F. Skinner and some other pioneers. It is based on three basic principles. The first is that rewarded behavior will naturally get repeated. When the trainee, whether it’s a dog or a person, is acting in the desired fashion a reward is given to reinforce that behavior. The second principle is that ignored behavior will stop. This actually works very well for a Pug who loves to have their owner’s attention. Pugs will respond very well to Positive Dog Training methods. They hate to be ignored! The third principle is that the reward mechanism will strengthen the desired behavior. The reward is actually manipulated at variable rates so that you’re not constantly rewarding your Pug every time they behave in the desired fashion. Skinner discovered that giving the reward periodically reinforces the good behavior just as strongly as giving the reward all the time once the desired behavior has been achieved. This variable reward schedule is key to the principles of Positive Dog Training. An owner would go crazy and a dog would become incredibly overweight if a food reward was given every single time good behavior was performed. There are many books on the subject and most trainers use Positive Dog Training in their work. You may have seen some of these trainers use a clicker, a small metal device that makes a clicking sound when depressed. You’ll hear the clicker whenever the dog models the desired behavior. What has happened here is that the clicking sound has been used in the beginning of the training at the same time the physical treat or reward is given so that the dog now associates the click with the positive experience of being rewarded. This is a little bit of an oversimplification of the theory and practice but we present it to you to give you an idea of some of the principles of Positive Dog Training. These methods require some study but they are not that difficult to understand and they will definitely help you in your dog training. Training can be a very enjoyable experience and will definitely increase the bond between you and your Pug. The good news is that these methods are learnable and will not add to the time it takes to train your dog. In fact, just the opposite has been shown to be true: Positive Dog Training Methods will accelerate the learning process. Some people say that you will create a dog that will only respond to food. That would be true if the only reward was food based. But there are other rewards for your dog such as petting and playing. If these are left out of the training process then you will, indeed, create a dog who will only perform for food. We all know how much a Pug loves to eat so you do have a little bit of a danger there. But Pugs also like affection and playing with their owner and they will respond very well if that is used as a treat and a reward for good behavior as well. As we have said, there are books on this subject so we could not possibly hope to present a training course here. 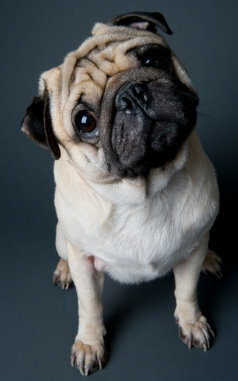 We encourage you to pursue this topic further because you will have the ultimate reward in the end: a well trained Pug. For owners who feel they do not have the patience there are schools and trainers who will train your dog for you. Obedience schools are certainly one choice you can make but we think you will be losing out on a great opportunity to learn how to control the learning process for your Pug. Learning and practicing the principles of Positive Dog Training can be a very enjoyable process for you and your Pug. You might want to check out how Positive Dog Training forms the foundation to achieving the Canine Good Citizen award. If you'd like to learn more about "Clicker Training", click on the picture below. You'll be amazed at what you can accomplish through positive reinforcement. After all, there's only one thing better than and an adorable Pug and that's a well trained, adorable Pug!